The Oseberg ship (Norwegian: Osebergskipet) is a well-preserved Viking ship discovered in a large burial mound at the Oseberg farm near Tønsberg in Vestfold county, Norway. This ship is commonly acknowledged to be among the finer artifacts to have survived from the Viking Era. 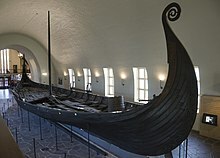 The ship and some of its contents are displayed at the Viking Ship Museum at Bygdøy on the western side of Oslo, Norway. The Oseberg burial mound (Norwegian: Oseberghaugen ved Slagen from the Old Norse word haugr meaning kurgan mound or barrow) contained two female human skeletons as well as a considerable quantity of grave goods. The ship's interment into its burial mound dates from AD 834, but parts of the ship date from around 800, and the ship itself is thought to be older. It was excavated by Norwegian archaeologist Haakon Shetelig and Swedish archaeologist Gabriel Gustafson in 1904–1905. The ship is a Karve, clinker built almost entirely of oak. It is 21.58 metres (70.8 ft) long and 5.10 metres (16.7 ft) broad, with a mast of approximately 9–10 metres (30–33 ft). With a sail of c. 90 square metres (970 sq ft), the ship could achieve a speed up to 10 knots. The ship has 15 pairs of oar holes, which means that 30 people could row the ship. Other fittings include a broad steering oar, iron anchor, gangplank, and a bailer. 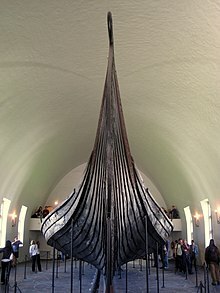 The bow and stern of the ship are elaborately decorated with complex woodcarvings in the characteristic "gripping beast" style, also known as the Oseberg style. During the debate on whether to move the original ship to a new proposed museum, thorough investigations were made into the possibilities of moving the ship without damaging it. During the process, very thorough photographic and laser scans of both the outside and inside of the ship were made. In 2004, an attempt to build a copy of the Oseberg ship was launched. A collective effort of Norwegian and Danish professional builders, scientist and volunteers engaged in this new attempt with the photo scans and laser scans made available free of charge to the enthusiastic builders. During this new attempt it was discovered that, during the initial restoration of the ship, a breach in one of the beams had been made and that the ship was therefore inadvertently shortened. That fact had not been appreciated earlier. It is believed this was perhaps the prime reason why several earlier replicas sank: previous attempts at working replicas had failed owing to a lack of correct data. In 2010, a new reconstruction was started, entitled Saga Oseberg. Using timber from Denmark and Norway and utilizing traditional building methods from the Viking age, this newest Oseberg ship was successfully completed. On the 20th of June 2012 the new ship was launched from the city of Tønsberg. The ship floated very well and in March 2014 it was taken to open seas, with Færder as its destination, under full sail. A speed of 10 knots was achieved. The construction was a success, the ship performing very well. It demonstrated that the Oseberg ship really could have sailed and was not just a burial chamber on land. Model of Oseberg Ship in Maritime Museum in Stockholm, Sweden. The skeletons of two women were found in the grave with the ship. One, probably aged around 80, suffered badly from arthritis and other maladies. The second was initially believed to be aged 25–30, but analysis of tooth-root translucency suggests she was older (aged 50–55). It is not clear which one was the more important in life or whether one was sacrificed to accompany the other in death. The younger woman had a broken collarbone, initially thought to be evidence that she was a human sacrifice, but closer examination showed that the bone had been healing for several weeks. The opulence of the burial rite and the grave-goods suggests that this was a burial of very high status. One woman wore a very fine red wool dress with a lozenge twill pattern (a luxury commodity) and a fine white linen veil in a gauze weave, while the other wore a plainer blue wool dress with a wool veil, possibly showing some stratification in their social status. Neither woman wore anything entirely made of silk, although small silk strips were appliqued onto a tunic worn under the red dress. Dendrochronological analysis of timbers in the grave chamber dates the burial to the autumn of 834. Although the high-ranking woman's identity is unknown, it has been suggested that she is Queen Åsa of the Yngling clan, mother of Halfdan the Black and grandmother of Harald Fairhair. Recent tests of the women's remains suggest that they lived in Agder in Norway, as had Queen Åsa. This theory has been challenged, however, and some think that she may have been a shaman. There were also the skeletal remains of 14 horses, an ox, and three dogs found on the ship. Examinations of fragments of the skeletons have provided more insight into their lives. The younger woman's teeth showed signs that she used a metal toothpick, a rare 9th century luxury. Both women had a diet composed mainly of meat, another luxury when most Vikings ate fish. However, there was not enough DNA to tell if they were related, for instance a queen and her daughter. The so-called "Buddha bucket" (Buddha-bøtte), a brass and cloisonné enamel ornament of a bucket (pail) handle in the shape of a figure sitting with crossed legs. The grave had been disturbed in antiquity, and precious metals were absent. Nevertheless, a great number of everyday items and artifacts were found during the 1904–1905 excavations. These included four elaborately decorated sleighs, a richly carved four-wheel wooden cart, bed-posts, and wooden chests, as well as the so-called "Buddha bucket" (Buddha-bøtte), a brass and cloisonné enamel ornament of a bucket (pail) handle in the shape of a figure sitting with crossed legs. The bucket is made from yew wood, held together with brass strips, and the handle is attached to two anthropomorphic figures compared to depictions of the Buddha in the lotus posture, although any connection is most uncertain. More relevant is the connection between the patterned enamel torso and similar human figures in the Gospel books of the Insular art of the British Isles, such as the Book of Durrow. More mundane items such as agricultural and household tools were also found. A series of textiles included woolen garments, imported silks, and narrow tapestries. The Oseberg burial is one of the few sources of Viking age textiles, and the wooden cart is the only complete Viking age cart found so far. A bedpost shows one of the few period examples of the use of what has been dubbed the valknut symbol. The conservation of the wooden artifacts is an ongoing problem. On May 3, 2011, thirteen years after debate began over the disposition of the ship, Norwegian Minister of Education Kristin Halvorsen stated that the ship will not be moved from Bygdøy. The Oseberg ship (Viking Ship Museum, Norway). Excavation of the Oseberg ship, 1904/5. Moving the ship on rails to its current location at Bygdøy, September 1926. Barrel in the Oseberg ship. Part of the rudder, or "steering board" (hence the term "starboard") of the ship. ^ a b Durham (2002:16). ^ "Karve ships". thevikingships. Retrieved August 15, 2016. ^ "Oseberg Viking Skip". Stiftelsen Nytt Osebergskip. Retrieved August 15, 2016. ^ Holck, Per (August 2006). "The Oseberg Ship Burial, Norway: New Thoughts On the Skeletons From the Grave Mound". European Journal of Archaeology. 9 (2–3): 185–210 . doi:10.1177/1461957107086123. ^ Bonde, Niels; Christensen, A.E (1993). 'Dendrochronological dating of the Viking Age ship burials at Oseberg, Gokstad, and Tune, Norway (67 ed.). Antiquity. pp. 575–83 . ^ Kruger, Sverre (June 9, 2007). "Dronning Åsa av Oseberg – Forskerne har nå avslørt droning Åsa som Oseberghaugens herskerinne". Nrk.no. Retrieved 2010-04-11. ^ Holck, Per (2006). "The oseberg ship burial, Norway: new thoughts on the skeletons from the grave mound". European Journal of Archaeology. Cambridge University Press (CUP). 9 (2–3): 185–210. doi:10.1177/1461957107086123. ISSN 1461-9571. ^ Berglund, Nina (Mar 26, 2007). "Viking woman had roots near the Black Sea". Aftenposten.no. Archived from the original on 2010-08-26. Retrieved 2010-04-11. ^ Holck, Per (2013). "The Oseberg Ship Burial, Norway: New Thoughts On the Skeletons From the Grave Mound". European Journal of Archaeology. Eja.sagepub.com. 9 (2–3): 185. doi:10.1177/1461957107086123. Retrieved 2010-04-11. ^ "Borromean Triangles: A Viking Symbol". Liv.ac.uk. 2007-07-27. Retrieved 2010-04-11. Doyle, Alister (Apr 25, 2008). Vikings acquitted in 100-year-old murder mystery. Reuters. Wikimedia Commons has media related to Oseberg ship. This page was last edited on 17 April 2019, at 19:28 (UTC).